Who will be the World Cup's Best Young Player? 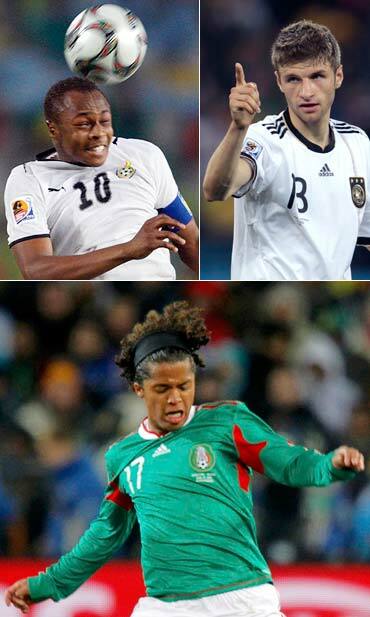 FIFA's Technical Study Group (TSG) on Friday shortlisted Germany's Thomas Mueller, Mexico's Giovani Dos Santos and Ghana's Andre Ayew for the Hyundai Best Young Player award, which is presented to the best young footballer in this year's World Cup. The award continues the tradition of officially recognising the positive impact made by young footballers and is open to all participating players under 21 years of age on July 11. The winner will be selected by the FIFA TSG and announced on FIFA.com after the final between Spain and the Netherlands. He will receive the coveted Hyundai Best Young Player Award trophy and a new Hyundai Tucson ix 35. The emergence of young footballing talent on the world stage is one of the joys of any FIFA World Cup and the 2010 FIFA World Cup South Africa is no exception. These burgeoning young stars may have been relatively unknown before the opening ceremony in Johannesburg, but there is little doubt that the three nominated for the prestigious Hyundai Best Young Player Award shortlist can become household names for many years to come. All the three players shortlisted demonstrated exceptional skills during the tournament as well as youthful and refreshing playing styles combined with tactical maturity. Furthermore, their creativity has served as an inspiration to all and earned fan recognition for their performances. The Hyundai Best Young Player Award is one of the official FIFA awards and is selected by the Technical Study Group, a FIFA-appointed group of top football coaches and analysts, whose director Jean-Paul Brigger is a former Swiss international, Swiss domestic league champion with FC Sion and the country's Player of the Year in 1992. He is also a five-time winner of the Swiss Cup and was named Swiss coach of the year in 1995. Other prominent members of the TSG are Christian Karembeu, G rard Houllier, Holger Osieck, Kalusha Bwalya and Ephraim Matsilele 'Jomo' Sono. Thomas Mueller's rapid rise through the senior football ranks is nothing short of remarkable. A fringe player with his club, Bayern Munich, just two seasons ago, and with a first international cap coming only in March of this year (presciently, a friendly against Argentina), the 20-year-old striker has captured the imagination of fans everywhere with his pulsating approach play and vital goals (4) and assists (3). He scored two goals in the round of 16 match against England to take Germany through to the quarter-finals, making him the youngest player since Pele to score multiple goals in a knock-out round, and the youngest German since Franz Beckenbauer to do so in any game. A product of Bayern's youth system, he made his first-team breakthrough under new Bayern manager Louis van Gaal during the 2009 10 season, playing almost every game as the club won the league and cup double, and reached the Champions League final. Still only 21, Giovani Dos Santos is one of the most famous faces in the Mexico squad. "Gio", who played much of the most recent club season on loan to Turkish side Galatasaray, burst on to the scene aged 16 when he showed prodigious technique and vision in helping Mexico to victory in the FIFA Under-17 World Cup in Peru in 2005. The super-nimble young forward has become a key cog in the attractive Tricolor team and looks sure to be around for years to come. Dos Santos was a member of the Mexican National U-17 team that won the 2005 U-17 World Cup held in Peru. The son of Black Stars legend Abedi Pele, 'Dede' Ayew is used to living his young life in the footballing spotlight and he has handled the attention with great poise. He already became a world champion with the U-20s in Ghana last year. 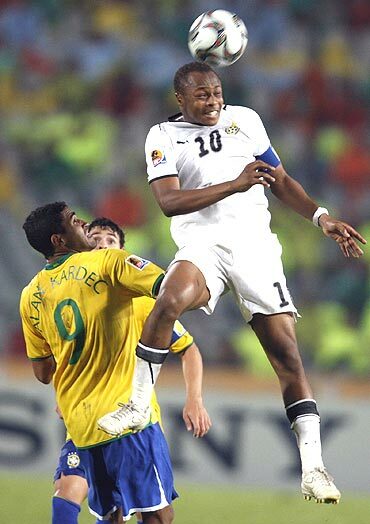 As an attacking midfielder, Ayew has become an important part of Ghana's playing system with a successful pass rate of 85 per cent. Ayew plays as a winger, but can play as a striker. He is the second-born son of the three-time winner of the African Footballer of the Year award and FIFA 100 member Abedi Pele and has three other brothers, Ibrahim, Jordan, and Imani who also play football.